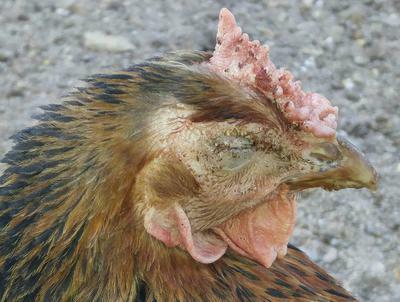 One of our hens suddenly has a closed eye and small crusty black spots on her comb on the same side. The wattle on that side is mottled red and white, and is bald of feathers. The other side of her face is completely normal. If this were my chicken I would try to open the eye and see what's going on. She may have been injured with infection setting in and spreading to surrounding tissues. Often an infection can kill feathers in an area, especially small ones. I would definitely get the eye opened and treat it with an antibiotic ointment. This isn't a symptom of any disease that I'm aware of, but it's always good to take precautions and isolate a chicken in this condition. It's in part for her protection and for the flock's as well, just in case it's something contagious. If this is a simple infection treating it with topical antibiotics may help. If the eye ball has been damaged, this could take a while to heal. Watch for other signs, including: her appetite, droppings, congestion, weight loss & signs of this affecting other parts of her body.